I know I said I can't wait, I can't wait and this is gonna be fun but when Saturday came, dread wrapped its steel arms around me and tightened as each hour drew me closer to seeing HP7 Part 2. I really hadn't wanted to go and thought briefly of not seeing it just to delay a little longer. All day Saturday, I just couldn't concentrate on anything else. I've been writing this post in my head since last Thursday. We comfort ourselves by saying Harry Potter will never die, which is true, but the fact still remains, it's over. 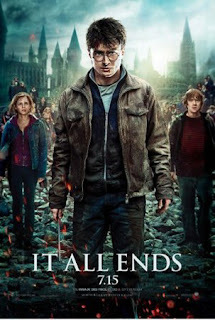 When I first saw the movie poster and the slogan "It all ends." I thought it sounded cool. It's a good summation of the final book but the more I think about it the more I dislike it. Yes, we know it all ends; you don't have to rub it in our faces. I own a lot of books. I've been reading since I knew how but Harry Potter was always my favorite series. I've known the characters for about 12 years now. Even now, when the series has ended and my library has grown, it is still the series I reread the most. But, it's all over. Everyone has grown up and gotten married. Their kids are now off to Hogwarts. The adventure is over. We are left with only beautiful memories. While on my way the movies, I kept telling myself this is only a book, they are only characters. They aren't real. It is technically true but they stopped being merely characters a long time ago. They've become people we care about- a mark of J.K. Rowling's brilliant writing. Reading it felt like we were getting a view of a real secret world. Harry Potter is about the only book I've read that had me so thoroughly believing their world could actually exist and I've read a lot of fantasy novels. 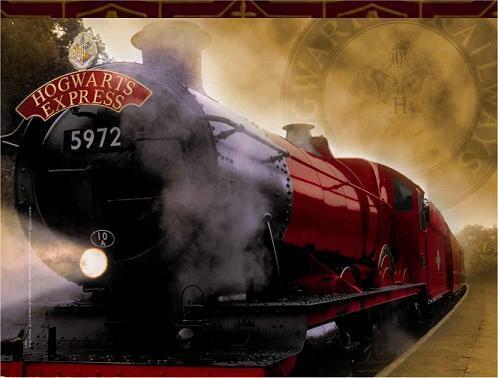 I feel I can go to Kings Cross and walk through the wall between Platforms 9 and 10. Enough of this, I'm depressing myself and you. The movie was brilliant as I knew it would be. It was so worth the wait and the hype. They did the book justice. Yes, they changed things but how is that anything new. The things they changed weren't as annoying this time. I have to say, I'm kind of upset with the crew behind Harry Potter. The only movies of the series I really enjoyed where the first 3. With 4-6, I left the theater unsure whether or not I liked them. They just changed so much. I wanted to see my favorite book on screen not someone's interpretation of it. I had to watch 4-6 again to really like it but with HP7 Part 1 and 2, I was in the theater thinking this is a spectacular movie. Why did they wait until the end to get it right?! Going into Part 2, I was afraid they'd milk Fred, Lupin, and Tonks' death. Reading about it was bad enough; I didn't want to see it. I was pleased with how they treated their death. They gave them enough importance without making the movie unbearable to watch. Snape's death, however, was rough but they had to do him justice. I mean he's like the bravest person of the series. I heard a lot of sniffling during the Snape flashback. It was nicely done. Alan Rickman was spectacular. I was a bit disappointed with the ending fight though. Some people had problems with how the final Harry/Voldemort fight was written but I liked it. It didn't need to be drawn out. I also liked how, in the book, Harry had this amazing dialogue with Voldemort which they didn't include in the movie. Though Percy is not my favorite Weasley, they can't have him disappear then reappear without any explanation. ...as it left the platform with children waving out the window. In the background was the Harry Potter theme song. A song they hadn't played since, like, the 3rd movie. You know the one I'm talking about. It ended where it started and what a beautiful ending it was. I thought I would leave the theater upset about the end of my favorite series but I couldn't stop smiling- such a fitting ending to a brilliant series. Thanks for sharing all of this. I probably won't see the movie for a while and I was dying to know if they did it justice. And now I can brace myself for Snape's death. If it made people cry, then I know it will make me cry. Very interesting and informative article indeed. I have to admit that I always follow all news about this.